Trees are one of the most important parts of our woodland on the Highland Titles Nature Reserve. They grow into large, beautiful structures and play a big role in conservation – providing shelter, food and oxygen to the inhabitants of the reserves and beyond. Unfortunately, huge areas of woodland in Scotland are covered with non-native softwoods such as Sitka spruce, which sadly provide nothing of value to any other plants or animals; it can even be said that a Sitka forest is a hostile environment for Scottish wildlife. Planted years ago, usually for the use of commercial forestry, they grow faster than native species, and use up valuable resources which, therefore, starves the native species that once grew far and wide in the Caledonian Forest of Scotland. As the Highland Titles estate is conservation land, it is extremely important to us that wildlife, flora and fauna can flourish. 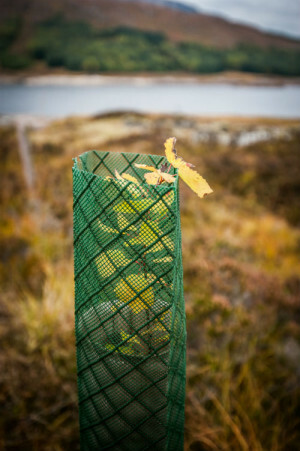 To reach this goal, the planting of Scottish broadleaf native trees has been a project ongoing since the very beginning. The native trees provide a wealth of food and homes to residents on the reserve. The recent discovery of the red squirrel returning to the reserve, for instance, is proof that our hard work is paying off! We are also excited to announce that we will be introducing a tree nursery behind the Visitor’s Centre cabin at Glencoe Wood! It will contain seedlings we have collected from our own woodlands from the great Scottish broadleaf native trees already existing including hazel, oak and the alder. We plan to use local stock to plant the native species due to the genetic adaptation of these trees to the environment. Imported trees can contain diseases that local trees are unable to fight off (namely the Ash Dieback caused by a fungus from a foreign tree) so using locally sourced species will allow the trees to flourish without fear of infection. Our trees have previously been sourced from a local company, Taynuilt Trees, which we will continue to use with the addition of the tree nursery. By planting the seeds in a poly tunnel, the seeds can germinate in a protected environment. This will be a cost-effective way of planting trees and will now be carried out continuously on site. The initial steps of the project are currently underway, with the first batch of seedlings being collected and ready to plant in the poly tunnel once it is ready. Follow along to stay updated on how the nursery progresses. If you’d like to be a part of it, remember that you can, indeed, dedicate a tree for yourself or a loved one, on the reserve! It’s a great holiday gift for those interested in conservation! For more information about native trees of Scotland, check out our Tremendous Trees series on the Highland Titles community! VERY nice to be kept in the picture and up-to-date on all the happenings on our sites. Thank you. Thank you for all the work you’re doing to make sure that lots of native trees will be flourishing again. Living in Australia, I love logging on to catch up on what is happening. One day I will get to visit my square foot of land.